The summit will be held under the auspices of the Turkish presidency of the G20 at the Regnum Carya Hotel Convention Center. It will bring together 13,000 officials and delegates from member countries, About 3,000 journalists are expected from around the world to follow the summit. World leaders are expected to arrive at Antalya starting from November 14. The G20 Leaders’ Summit in Antalya will contribute a great deal to tourism in 2016 and is expected to bring 200 million euros (US$215 million) to the country's economy. Before the summit, about 60 minister meetings and events have been arranged in different provinces around the country as a part of the G-20 presidency. In the aftermath of the summit, Turkey will have hosted 60,000 foreign visitors in the G-20 events. After Saudi Arabia, China reserved the second-highest budget for the summit. They have closed a 450-room hotel and will be using 500 cars. Russia follows the U.S. representatives, which has closed two hotels with a total of 800 rooms. The hotel in which Russian President Vladimir Putin will also stay has 300 rooms. 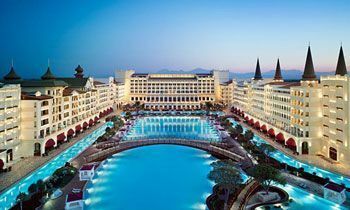 According to the news in media, Saudi Arabia paid US$18 million for the closure of Mardan Palace Hotel for their king’s 18 days stay. World leaders visiting Turkey will also enjoy the famous Turkish delights as they will be gifted 21 boxes of sweets by a local producer on the instruction of President Recep Tayyip Erdoğan. The G20 is the premier forum for its 19 member countries and the EU. The G20 president invites several guest countries each year to its annual meeting. The G20 was formed in 1999 as a meeting of finance ministers and central bank governors in the aftermath of the Asian financial crisis. Later on in 2008, the first G20 Leaders' Summit was held and the forum played a key role in helping member countries respond to the global financial crisis. Since then, G20 leaders have met nine times. The G20 is supported by international organisations, including the Financial Stability Board, the International Labour Organisation, the International Monetary Fund, the Organisation for Economic Co-operation and Development, the United Nations, the World Bank and the World Trade Organization. Previous hosts of the G20 Leaders’ Summit were the United States (in 2008 and 2009), the United Kingdom (2009), Canada (2010), the Republic of Korea (2010), France (2011), Mexico (2012), Russia (2013) and Australia (2014).